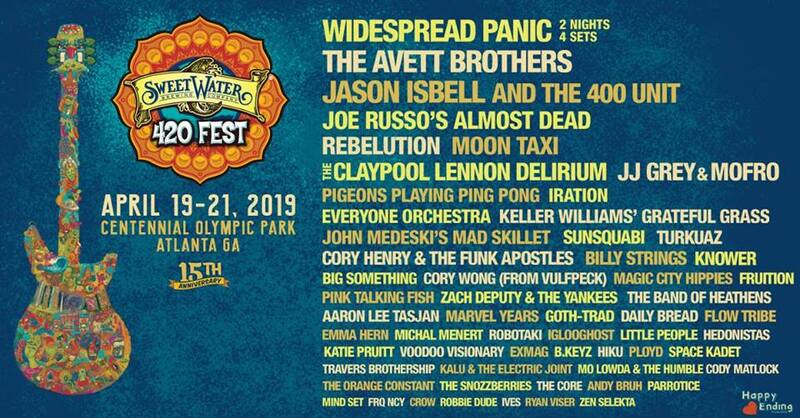 April 19-21, 2019 celebrating its 15th anniversary offering four stages hosting over 60 sets of music featuring a varied lineup of jam, rock, Americana, alternative, reggae, EDM, local artists and comedians. Magic City Hippies, Fruition, Pink Talking Fish, Zach Deputy & The Yankees, The Band of Heathens, Aaron Lee Tasjan, Marvel Years, Goth-Trad, Daily Bread, Flow Tribe, Emma Hern, Michal Menert, Robotaki, Iglooghost, Little People, Hedonistas, Katie Pruitt, Voodoo Visionary, Exmag, B.Keyz, Hi-Ku, Ployd, Space Kadet, Travers Brothership, Kalu & The Electric Joint, Mo Lowda, Cody Matlock, The Orange Constant, The Snozzberries, The Core, Andy Bruh, Parrotice, Mind Set, Frq Ncy, Crow, Robbie Dude, Ives, Ryan Viser, & Zen Selekta. SweetWater Experience will serve unique SweetWater Brewing Company craft beer samplings, Planet 420 will teach eco-friendly tips while celebrating Earth Day, Lyrics & Laugher will keep you laughing and the 420 Disco will keep you dancing. Peachtree Road Race qualifier SweetWater 420 Fest 5K returns in the heart of downtown Atlanta. For course info visit SweetWater 420 Fest 5K.